Janus was the Roman God of beginnings and endings, and hence over war and peace. He represented time, because he could see into the past with one face and into the future with the other. This may be why, in modern times he has often been associated with conflicting faces of the same entity. The last week of August, 2018, marked a uniquely Janusian moment for Americans: the funerals of a celebrated white, Anglo-Saxon war hero, John McCain, and a gospel singer revered the world over, Aretha Franklin. The unique achievement of the former in occupying the news cycle for a full ten days blinded the media to the significance of the fact that a man known worldwide as a war monger shared his last spotlight with a black woman dressed in gold, lying in a gold coffin. While John McCain’s daughter Cindy, cried profusely while evoking his love, at Franklin’s funeral, former President Bill Clinton said in the light-hearted way that endeared him to so many, that he had been curious to see how she would be dressed. 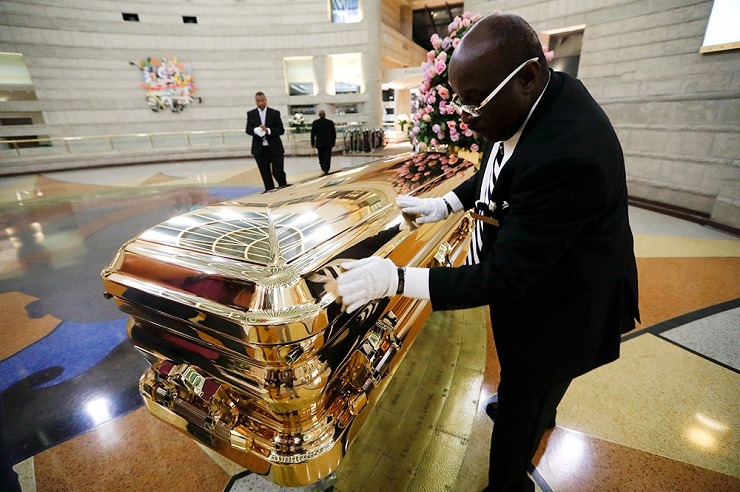 Even in death, the daughter of a Black minister was seen as frivolous while the white, Anglo-Saxon soldier whose wife wore a quadruple strand of pearls was given a presidential level funeral. Confirming the opinion many Black Americans have of his presidency, Barack Obama chose to speak at his former rival’s funeral rather than mark his solidarity with the singer who graced his inauguration. Lost on the media, however, was the profound difference between what each of them represented to the outside world: America’s “greatness” (one of McCain’s last statements was that America didn’t need to become ‘great again’, in Donald Trump’s words, because it had always been great), and Franklin’s artistic achievement, at a time when his acolytes, under Biblical cover (as when Senator Lindsey Graham read from St John) openly discuss next steps in the policy intended to ensure that seventy years of US hegemony continues into the future as far as Janus can see, while ignoring the sins of his past.